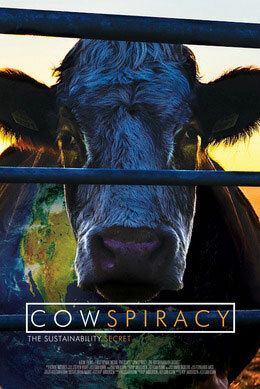 "Cowspiracy is about spreading propaganda to further an agenda and not an in depth or real discussion on what needs to be done or can be done to reduce global emissions." the film fails to refer to the more recent 2013 revisions to that report from the FAO that lower the prior report's livestock emission numbers, and that also states that agricultural emissions can be cut an additional 30% with better management practices. So essentially the movie starts with an often quoted, but still, false premise. The movie doesn't also recognize that the intent of the authors of the 2006 FAO report was to provide an argument for "intensification" i.e. more factory farms, and not less meat consumption. Cowspiracy provides a lot of graphics with numerical statistics but doesn't really explain how any of these numbers were calculated...figures lie, and liars (especially a certain dentist) figure or, at least, spin data and "facts" to reinforce their biases. The modus operandi? Repeat the spin often enough so, even if it is a lie, it becomes the truth. "Cowspiracy provides a facile solution, dressed up with shoddy numbers, and in its effort to push a predetermined agenda it doesn’t begin to answer the questions a person should ask when deciding what to eat." 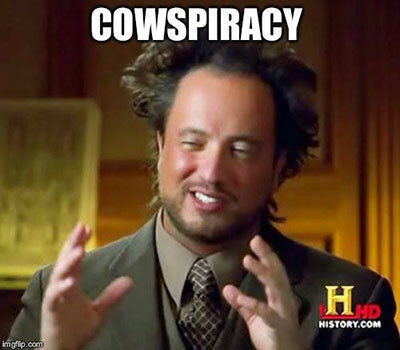 "Cowspiracy...uses "facts" and talking heads to further the filmmaker’s particular agenda. Under the guise of concern for climate change"
It is obviously to someone’s benefit to make meat eating and livestock raising an easily attacked straw man (with the enthusiastic help of vegetarian groups) in order to cover up the singular contribution of the only new sources of carbon — burning the stored carbon in fossil fuels and to a small extent making cement (both of which release carbon from long term storage) — as the reason for increased greenhouse gasses in the modern era. If cattle flatulence on a natural grazing diet were a problem, heat would have been trapped a 1000 years ago when, for example, there were 70 million buffalo in North America not to mention innumerable deer, antelope, moose, elk, caribou, and so on all eating vegetation and in turn being eaten by native Americans, wolves, mountain lions, etc. Targeting livestock as a smoke screen in the climate change controversy is a very mistaken path to take since it results in hiding our inability to deal with the real causes. When people are fooled into ignorantly condemning the straw man of meat eating, who I suspect has been set up for them by the fossil fuel industry, I am appalled by how easily human beings allow themselves to be deluded by their corporate masters.